Motherly love: a natural, beautiful, and, according to most people, unexplainable phenomenon. However, new research is attempting to explain the unexplainable; there are in fact specific chemicals driving the primal interactions of motherhood. Some hormones, like oxytocin, are already well-known, while the scientific tools to study other hormones have only recently been developed. An international study conducted by researchers at the University of Otago in New Zealand and the Saarland University School of Medicine in Saarbrucken, Germany indicates that the hormone prolactin has direct effects on the motherly behavior of adult female mice. These mice were surgically altered to eliminate prolactin receptors in one area of the brain – the hypothalamus. This is a very exciting result for the field of developmental biology, as prior to this study, prolactin’s effects on maternal behavior wasn’t fully understood. To learn more, cSw spoke to Dr. Rosie Brown from the University of Otago about her group’s findings. Q: What other hormones besides prolactin influence maternal behavior? A: During pregnancy there are changes in the secretion of many hormones, including the release of estrogen and progesterone from the ovary, both of which have long been known to have important actions in the brain in changing the way a mother behaves. Oxytocin is also known to be a regulator of maternal behavior. Q: How does prolactin work to influence behavior? A: Prolactin is released from the anterior pituitary gland in the brain. It acts on prolactin receptors throughout the body. As its name suggests, prolactin promotes lactation by acting in the mammary gland to induce milk production. 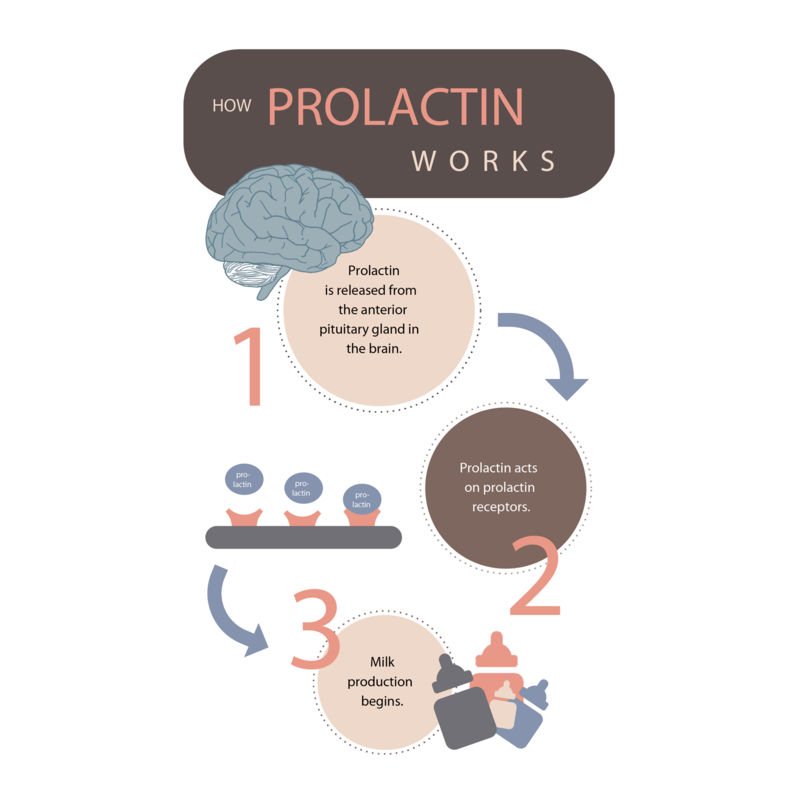 During most of pregnancy, the release of prolactin is actually suppressed because the placenta produces placental lactogen, a hormone (very similar to prolactin) which can act through the prolactin receptor and mimic its actions. At the end of pregnancy and following birth, prolactin levels are very high, so as to promote lactation. Q: How did you determine which behaviors to analyze to represent the maternal abilities of the altered mice? A: When looking at maternal behavior in mice, there are some behaviors commonly looked out for. These include: the ability to retrieve pups back to a nest when placed away from the nest, crouching over pups and nursing, licking and grooming pups, aggression towards intruders, and motivation to hunt out pups as opposed to other rewards (like food). The research group’s work, however, showed that by blocking prolactin action in just one region of the hypothalamus…all pups were abandoned and did not survive beyond the first 48 hours after birth. Q: Does a lack of prolactin affect milk production? If so, would a lack of an urge to nurse affect other maternal behaviors, such as visiting pups? A: Prolactin acts in the mammary gland to induce milk production. As these mice only had prolactin receptors removed from [one] area of the brain, prolactin signaling was intact in the rest of the brain and body. Therefore, these mice should have had the necessary signaling in place to be able to lactate. The death of the pups was a consequence of them being abandoned …The mother did not feed them, but there is no reason to suppose that it was because she was unable to. Q: What significance do you believe this study has? A: This study is the first demonstration that there is an absolute requirement for prolactin to be acting in the brain for a mammalian mother to care for her offspring. Previously, the role of prolactin in maternal behavior was unclear and was thought to have a more minor role. Now, we know otherwise. Plus…a whole network of cells in the brain that can respond to prolactin has been uncovered. This work illuminates the amazing power of science: even hormones that scientists have known about for years can play unique roles that are just beginning to be understood. With further studies from researchers like Brown and her team, we may have a key to understanding one of the mysteries of motherhood. Dr. Rosie Brown received her PhD in from the University of Otago in 2010 in the Department of Anatomy and the Department of Physiology. She is currently a Research Fellow at the University of Otago Medical School in Dunedin, New Zealand in the Department of Anatomy. Her research seeks to understand how a mother’s brain adapts during pregnancy through hormone signaling and other processes to facilitate a behavior change, allowing her to care for her young—an exciting area in the scientific community. Brown, Rosie. E-mail interview by the author. October 2017. My name is Alexander Fezza, and I am a junior at Biotechnology High School in Freehold, New Jersey. This is my first year participating in Curious Science Writers, and I love how this organization allows me to share fascinating biological findings with the world. I spend my free time writing, watching movies, and practicing Tae Kwon Do.